In the City of Roses, there are few things that affect each and every Portlander. Examples are limited to: Mayor Tom Potter’s decisions, Burnside bridge construction, gentrification and transplants from California. But recently, there has been one thing that hardens the heart of all Portland denizens… and it involves the legs of Greg Oden. Mr. #1-Pick-in-the-2007-Draft has been plagued with injuries since he joined the Portland Trailblazers. In what was supposed to be his rookie season, the Rose City King could be found cooling his heels (and knees) on the sidelines. 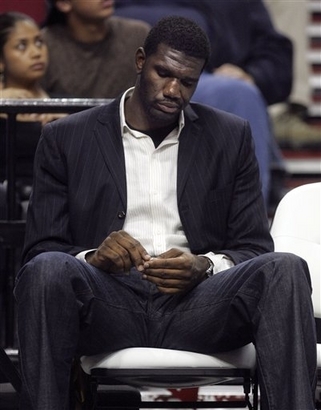 Oden underwent micro-fracture knee surgery before the 2007 season began, and if you are unfamiliar with this type of surgery, just Google it and you’ll find a plethora of Greg Oden knee articles. When the news broke out about Great Oden’s Knee it was a massive let down. Poised for a return to Rip City, Blazer fans were hoping to firmly put the last decade of play in the past. The Trailblazers have suffered from numerous setbacks to the program since the Jailblazer days of “medical” marijuana, domestic disputes and all-around bad attitudes. Each passing season led this city to believe all hope had been lost. There was a glimmer of greatness from Rookie of the Year, Brandon Roy, who provided sparkle on and off the court. And then, the impossible. Portland’s good luck magically extended to the NBA Lottery draft in which the Blazers pulled the #1 draft pick. This meant the 7’1″ dominating beast from Ohio State University would now wear black and red. People smiled. Season ticket sales went up. Angel’s got their wings. Now, a year later, with training camp in session, the starting lineup appears to be Brandon Roy, LaMarcus Aldridge, Martell Webster, Stephen Blake and Greg Oden heading into preseason. BUT then, as once again Portland sits on the brink of an awesome season, Oden is plagued by another injury. This time, it was an ankle “tweak”. Front page of the Oregonian. Portland gasped. Babies cried. The city of Cleveland called and gave Portland it’s condolences. It was that bad. The air seemed different and hope was lost. It remains to be seen how well Oden has recovered from the difficult surgery of ’07. Will he be our saviour or another Sam Bowie? The Blazers are loaded with young talent from around the world. However, our return to the playoffs will come from a dominant offense lead by gentle giant, Greg Oden. Get well soon, magical Legs of Oden. Portland’s ready for a return to Rip City.